2017 was a record year for the global solar industrial heat market. At least 110 large systems providing solar heat for industrial processes were put into operation adding up to 135 MW. 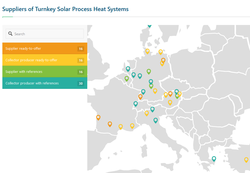 These are the key results of a survey that solrico carried out among the 80 turnkey suppliers of SHIP (solar heat for industrial processes) that are listed on the Solar Payback SHIP Supplier World Map. The total number of SHIP plants in operation at the end of 2017 stood at approximately 635 SHIP systems. Mexico and India led the list of newly installed SHIP systems in 2017, followed by China. The SHIP market was driven by economic competitiveness, a strong supply chain and policies to reduce air pollution. However, the majority of the SHIP suppliers were not satisfied with the overall business development last year. Not even half of the questioned companies were able to commission one or more SHIP installations in 2017. The reasons for the small success rate were low fossil fuel prices, limited awareness and a customer preference for short payback periods. Eight companies reported more than 5 installations. You find a comprehensive assessment of this global SHIP Supplier survey on solarthermalworld.org. The turnkey suppliers are listed on the SHIP Supplier World Map with the number of SHIP reference projects they realised by the end of 2017. The World Map also includes ready-to-offer suppliers that have not realised a SHIP reference system yet, but have experiences with large-scale solar thermal systems for public and private customers.